Researchers detail new secrets about how superconductivity and magnetism can be related, revealing more about the quantum world of electrons. Superconducting materials exhibit unexpected behaviors when subjected to magnetic fields or high pressures – discoveries that have implications for controlling electrons in those special materials. According to two studies, one conducted at the Paul Scherrer Institute in Switzerland with collaborators at Los Alamos National Laboratory and a second at Los Alamos in collaboration with the Sungkyunkwan University in South Korea, the superconducting material Cerium-Colbalt-Indium5 reveals new secrets about how superconductivity and magnetism can be related. Superconductivity and magnetism are normally seen as rivals – superconducting and magnetic electrons order themselves in very different ways. Like spinning tops, electrons in superconductors form pairs of tops, one spinning counterclockwise and one spinning clockwise. Together, these pairs move freely to conduct electrical current with zero resistance. Magnetic electrons, in contrast, lock themselves into a rigid arrangement that does not move. Two papers recently published in the journal Nature Physics show that electrons in Cerium-Colbalt-Indium5 are both superconducting and magnetic at the same time. In an experiment conducted at the Paul Scherrer Institute, researchers observed an entirely new form of superconductivity, one in which electrons form pairs with spinning tops moving clockwise and counterclockwise as well as pairs spinning in the same direction. This surprising new form of superconductivity appeared only when electrons were both superconducting and magnetic. As these researchers showed, the ordered arrangement of the magnetic electrons can be manipulated by modifying the direction of an applied magnetic field. These findings indicate the possibility of direct control of the quantum state of electrons which is linked to superconductivity. The possibility of directly controlling quantum states may be important for possible future quantum computers. Another study on CeCoIn5 also observed unexpected behavior. When small amounts of impurities were introduced into this material, superconducting electrons formed nano-droplets of magnetic order. As more impurities were added, the droplets grew and eventually overlapped causing the entire material to become magnetic. 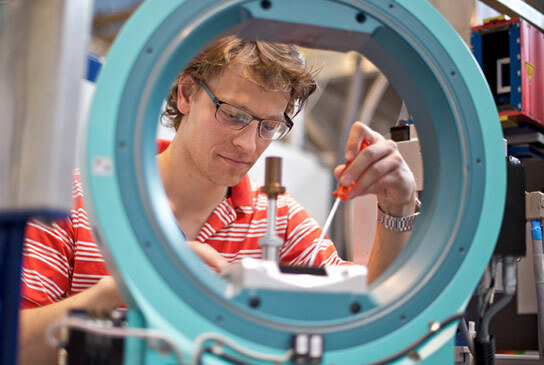 Applying pressure to the magnetic material globally reversed the effect of adding impurities and Cerium-Colbalt-Indium5 became superconducting again. Using a technique like magnetic resonance imagining (MRI), the researchers found, however, that nano-droplets of magnetic order remained but were hidden by the superconductivity. In effect, electrons in CeCoIn5 acted like an oil-vinegar salad dressing, with superconducting electrons playing the role of oil and magnetic electrons the role of vinegar. These studies of superconductivity in Cerium-Colbalt-Indium5 have shown that electrons are more adaptable than previously supposed. They can form a salad-dressing like state, which may be important for understanding properties of materials that until now have been mysterious, and they can pair simultaneously in two different configurations when they coexist with magnetic order. “Superconductivity continues to give new surprises. As its secrets are revealed, we learn more about the quantum world of electrons and can begin to imagine new ways to use them for future technologies. Superconductivity in Cerium-Colbalt-Indium5, discovered nearly a decade ago at Los Alamos, may be the Rosetta Stone that many of us have been looking for” says Joe Thompson, a collaborator in both studies. The papers “Switching of magnetic domains reveals spatially inhomogeneous superconductivity” and “Disorder in quantum critical superconductors” appeared back-to-back in the December 22, 2013 advanced on-line issue of Nature Physics. The first paper’s authors are Simon Gerber, Marek Bartkowiak, Jorge L. Gavilano, Nikola Egetenmeyer, Christof Niedermayer, and Michel Kenzelmann of the Paul Scherrer institute, Eric Ressouche from SPSMS, Grenoble, Andrea D. Bianchi of the University of Montreal, and Roman Movshovich, Eric D. Bauer, and Joe D. Thompson of the Condensed Matter and Magnet Science group at Los Alamos National Laboratory. Authors of the second paper are Seoboom Seo and Tuson Park of Sungkyunkwan University, Ricardo Urbano of UNICAMP, Campinas, Nick Curro of U. C. Davis, Long Pham and Zachary Fisk from U.C. Irvine, and Xin Lu, Jianxin Zhu, Eric D. Bauer, Vladimir A. Sidorov and Joe D. Thompson from the Condensed Matter and Magnet Science group at Los Alamos National Laboratory. Be the first to comment on "Researchers Reveal New Secrets about Superconductivity and Magnetism"